[email protected] is a 1U CubeSat developed for demonstrating the autonomous active attitude control capabilities based on magnetic actuation: in fact, the payload is an Active Attitude Determination and Control System. The commissioning phase foresees that the payload is deactivated leaving the satellite in its free tumbling motion, without any attitude stabilization. The A-ADCS starts its work when commanded from GCS, controlling the angular velocities and the attitude of the satellite. [email protected] is a follow-on of [email protected], the first Italian CubeSat and the first satellite of Politecnico di Torino to be inserted on orbit. More than 30 students worked on this project, using a unique opportunity of hands-on experience on space applications! [email protected] will demonstrate the ability of determining (with gyros and magnetometers) and actively controlling its attitude. [email protected] bus functionalities, as a basis for other CubeSats, will be demonstrated: it is a step towards future missions and applications. The Attitude Determination and Control Subsystem (ADCS) is the payload of [email protected] It is based on inertial and magnetic measurements, with magnetic actuation. It is activated only when the satellite reaches its final orbit. The system shall provide the detumbling of the angular velocities and the attitude determination.The core of the system is an ARM9 microcontroller that manages the interfaces between sensors, actuators and OBC, performing the control tasks. Stabilization and slew manoeuvres are performed through the activation of three magnetic torquers (MTs) mounted on three perpendicular planes. The satellite attitude is determined processing the data provided by a COTS Inertial Measurement Unit (IMU), which integrates two bi-axial magnetometers. Main changes w.r.t. [email protected] design are in the attitude control and determination algorithms, in the modes of operation of the payload rather than in the hardware configuration. In [email protected] the payload was activated autonomously on-board immediately after the CubeSat was released from the deployer. In the new design, the payload is activated upon command from the GCS. To permit this new functionality, a circuit has been added in the printed circuit board (PCB), w.r.t. [email protected] ADCS PCB. to detect autonomously faults and recover communications using stored software sequence and hardware reset. In particular, a beacon signal (self generated by the COMSYS and modulated in CW) has been implemented if no data are provided by the OBC for 5 minutes. In particular, the string “estar” is transmitted in Morse code. In case of a request for RF cessation, CW transmission can be stopped using a specific command from GCS. This command also works in case of OBC failure because it is executed directly from the COMSYS. The chosen communication protocol is the KISS AX.25 because is quite popular among the radio-amateurs, whose support to the mission is essential to collect large amounts of data. COMSYS is designed, developed and built by students at the STARLab of Politecnico di Torino in cooperation with ARI-Bra radio-amateurs. It is constituted by an electronic board that hosts a COTS radio-transceiver, a microprocessor unit and electrical devices to amplify, filter the signal and support the microcontroller operations. The antenna system is constituted by a RF part characterized by a dipole antenna, and a coaxial cable for the interfaces with the board, and by a mechanical device characterized by electro-mechanical components that deploy the antenna to its final articulation from the initial position in which is folded up. The antenna is closed using a Nylon cable with 0.29 mm diameter that has low elongation and total absence of mechanical memory characteristics. The main component for the modem function is the PIC16F88 that is the core of the system and performs the TNC/modem tasks. The data-rate is 1200 bit/s, which is sufficient for the telemetry packet (that is 110 bytes long) transmission. Buffering and flow control techniques are employed to ensure that data is not lost due to congestion. The radio module is the BHX2 produced by Radiometrix ltd. The module offers a 500 mW RF power output, a current consumption of 350 mA (@7.6 V) in TX and 30 mA (@7.6 V)in RX, and it is powered with the regulated battery channel (@ 5.5 – 8.2 V). The EPS is the system devoted to provide, store, control and distribute the electrical power on-board the [email protected] CubeSat. The schematic of [email protected] EPS is depicted in the Figure 17: as before, red connections are digital data links, those blue are analog signals, and then blacks are power connections. Taking into account the nature and envisaged duration of the [email protected] mission, Triple Junction GaAs solar arrays have been selected as primary energy source devices. 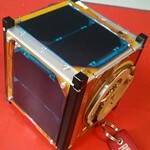 The solar cells will be arranged in five solar panels mounted on the external faces of the CubeSat. One face (-X side) remains free to host the antenna, its deployment system, and the connectors’ port. Each solar panel is constituted by two solar cells connected in series. The single solar cell dimensions are 4 cm x 7 cm, which is limited by the face dimensions. A temperature sensor is installed on each panel. CESI S.p.A. (Milan, Italy) is the supplier: the team started the collaboration with the company in 2005 with the realization of solar cells for PICPoT program and [email protected] in turn. As far as the storage, regulation and distribution functions are concerned, we have identified a suitable COTS unit and decided to employ it in the satellite. 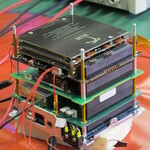 The chosen unit is the 1U CubeSat Electronic Power System CS-1UEPS2-NB/-20 by Clyde Space Ltd. The Clyde Space 1U EPS is compliant with the [email protected] requirements and needs. In particular, the board is optimised for LEO missions with a maximum altitude of 850 km. It is designed for integration with spacecraft that have six or less body mounted solar panels (i.e. one on each spacecraft face). The system integrates two daughter battery boards, which offer a total 20Wh capacity with low weight and volume. The battery systems host integrated heaters, which maintains the battery temperature above 0°C, enhancing operation at low temperatures. Over-current protection is provided to protect the cells in the event of a power line fault. The power control and distribution (PCM/PDM) network provides an unregulated Battery Voltage Bus, a regulated 5 V supply and a regulated 3.3 V supply available on the satellite bus. The EPS integrates multiple inbuilt protection methods to ensure safe operation during the mission and full range of EPS telemetries. The On-Board Computer (OBC) is the brain of the whole space segment. The board is a COTS component, the FM430 provided by Pumpkin Inc. The system includes the motherboard, an extended operating temperature 2GB SD card memory, an electro-mechanical Deployment Switch (DS) and an electro-mechanical Remove Before Flight (RBF) switch. The blocks scheme in Figure 21 highlights the main components of the subsystem: in this case, there are only power (black) and digital data (red) connections. Communications with the other subsystems take place through the main [email protected] bus interface. The telemetry packets and the entire mission data (i.e. time and health status) are saved in a SD card hosted on-board. The firmware and the software are loaded in an EEPROM. A watchdog circuit is present to avoid permanent failures on the OBC software execution flow. Real Time Operating System is SALVO®, and the custom software is developed by the CubeSat Team in the C++ environment. Capabilities and robustness of the OBC software have been verified by means of several functional test, which demonstrated good synchronization and stable communication with the microcontroller of the payload (ADCS), successful data distribution to the COMSYS, and operative modes management in any phase of the mission simulation. The structure is the [email protected] subsystem devoted to withstand all the loads imposed by the launch vehicle and the environment, to support and protect the payload and other subsystems, and to provide for separation devices. The design has been driven by the guidelines of the project: simplicity (both of design and of technologies), reliability, volume maximization and mass minimization. The structure has been designed to meet mission requirements and in compliance with the CDS. The designed structure consists of a lateral-box manufactured by a 100×410 mm sheet metal plate of 1.2 mm thickness, then appropriately folded and closed by means of rivets. The top and bottom panels are basically modified C-section plates, screwed to the lateral-box. One panel of the lateral-box is equipped to accommodate the antenna system and the ports to connect ground test equipment. These ports also allow to evacuate the air inside the CubeSat during the ascent avoiding air trapping. All other panels are covered by solar panels and related devices. The interface with the deployer and other CubeSats installed in the same deployer is guaranteed by means of two types of stand-offs and the deployment switch: two out of three supports in the bottom plate host the spring plunger devices, the third is a simple support (such as the four supports on the top plate) and the fourth is the DS. The basic principles in the selection of thermal control techniques have been simplicity and flexibility, since the thermal analysis of a satellite is a dynamic process constantly evolving, especially when the orbit is unknown for the mission. In the particular case of [email protected], we have started by choosing a completely passive system without Multi-Layer Insulation and we have verified by thermal analysis (based on different orbit simulations) that it would be sufficient to satisfy the temperature requirements of all components, ensuring the survival and proper functioning of the satellite throughout his life in orbit. External and internal thermal stresses with both “hot” and “cold” thermal environment conditions have been defined, and temperature profiles estimated for the structure, on-board electronics, batteries, solar panels and surfaces.